The PR Institute of Australia should know a thing or 2 about marketing & promotion. That's why they selected Bag People to create a long-lasting Reusable Bag to promote their recent awards event in Sydney. Bag People created a fantastic Canvas Tote Bag that was then filled to the max. with preview products from a variety of suppliers. The awards event brought together the finest PR & creative minds from within the industry to celebrate the creative brilliance from campaigns from the last 12 months. Bag People Custom-made the Canvas Bags specifically for the PRIA event as a direct marketing tool & promotional item. 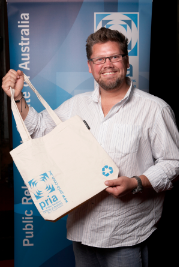 If the PR Institute of Australia use Bag People to gain exposure; maybe you should too.